The ACT TAMU Chapter has joined in with FAST, Alpha Gamma Rho and Sigma Alpha, Beef Cattle Association, Collegiate 4-H and FFA, Saddle & Sirloin, Texas Aggie Cattlewomen, I Love Farmers, ALEC Aggie Reps, and COALS Council to form a student-led movement reconnecting American society back to the world of agriculture. We are advocates for agriculture. (left to right) Dakota Fleming, Jackie Hill, Angela Lin (me), and Tray Heard. 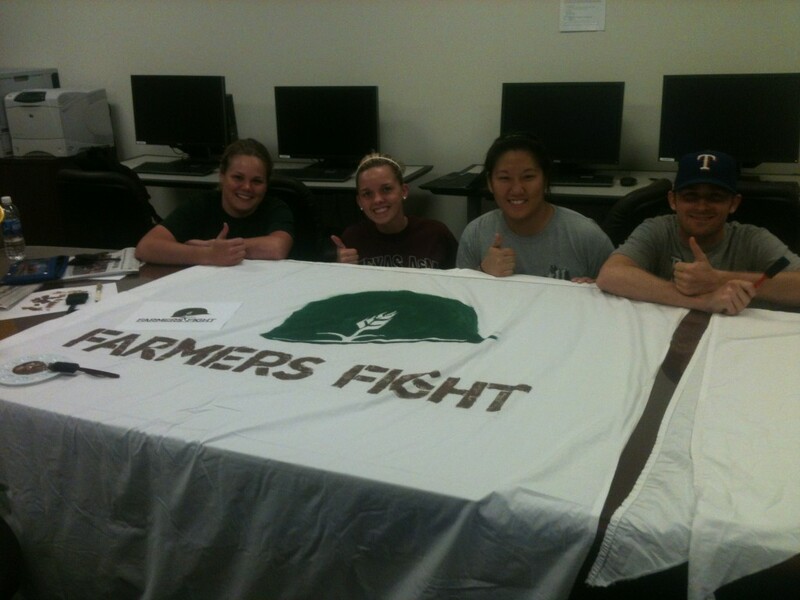 A few of us working on the banner for the Farmers Fight social media booth! If you are interested in learning more or getting involved, contact farmersfight2012@yahoo.com. Farmers Fight will be a part of “agvocacy” day on April 12, 2012 at Texas A&M University! WHOOP! A few students and I have taken the initiative to bring back an organization, Public Relations Student Society of America, that has been dormant for the last year. For the last few weeks we have accomplished many tasks such as writing an email to bring in prospective members, make a list of future guest speakers, and be continually involved with PRSSA online through facebook and twitter. I am currently working with the Drupal program and updating the TAMU PRSSA website.